When I was looking through pictures of Henry on my phone for his birthday post, I realized just how fond I am of this horse. Not only for his attributes as an athlete, but mostly because of his general every day qualities and fantastic character. The things you wouldn’t really put in a sale ad, as it were, but the things that make you happy to be around them on a day to day basis. What are the “little things” about your horse that you’re so fond of? The most obvious one for Henry is his pro-level Derp Face. 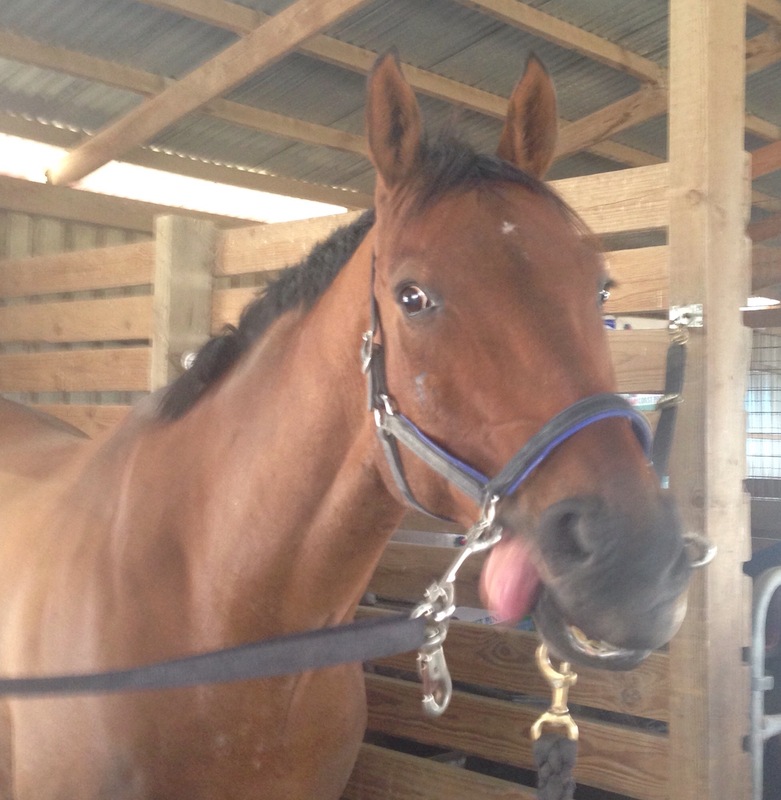 He plays with his tongue almost constantly while he’s in the crossties, so he looks extraordinarily derpy most of the time. Until he thinks you have a cookie, that is. He learned the head tilt thing from Halo. It’s also pretty cute how he meets me in the pasture 99% of the time when he sees me coming (even though I know it’s mostly because he wants cookies). Henry is a great traveler. He loads well, he rides well, he eats and drinks great, and he’s well-behaved in new places. This is a fantastic quality when you’re on the road a lot. He’s not spooky. Well ok, let me amend that statement. He’s not spooky about things that horses are typically spooky about. Traffic, loose horses, tractors, etc – all good. But when he feels like being cheeky, all bets are off, and the more mundane the object is (grass, bushes, and jumps outside of the arena are his favorites) the scarier it is. Logic, he gots it. But most of the time I can count on him to not be an idiot in situations where it really matters. And last but certainly not least – Henry and I both have similar feelings about Bobby. Previous He got a real pretty mouth, ain’t he? Next Leistner review and Teddy’s Tack Trunk Giveaway! lolz *write…. someone get this girl a cup of coffee…. Henry’s faces are da best! The love and adoration is moreso. Speaking of, you haven’t gotten a good hug in a while!!! you JUST hugged me the other day. Get off me! Yeah, like I said, it’s been a while!! Henry is so rad 🙂 Thank you for this! Will be joining the hop shortly.